The protest at Standing Rock was born from the need to protect water and the environment from the Dakota Access Pipeline, which had been routed away from areas populated predominately by white people and through Native American land. While the protesters, or water protectors, are fighting for water, there are much larger issues at play—the most obvious being the treatment of natives and the disrespect of reservation land. But the people taking a stand are also fighting for something that will affect all of us, whether we think we care about clean water or not. Note that police are concealing their badge numbers and faces as to avoid accountability for their actions. This wasn’t the original plan for the DAPL protest. It began with environmentalists standing up, as they do with all pipelines, with members of the Sioux who were defending their land. It drew national attention largely because of the election. 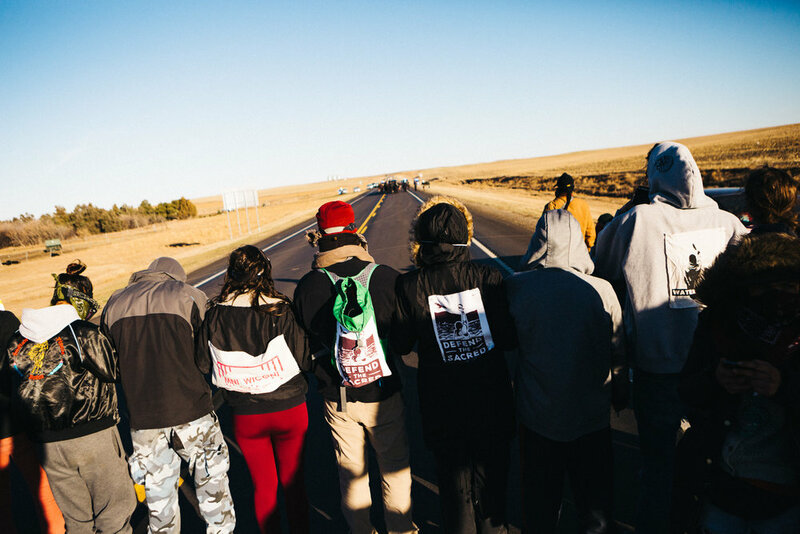 That attention in turn inspired indigenous people and allies from all over the country to stand with Standing Rock. Sacred fires are being rekindled along with sacred bonds. Until now, there hasn’t been a singular event that inspired such indigenous unity and an openness to work together. It’s because these issues aren’t unique to Standing Rock, all indigenous people face them and have faced them for centuries. This just opened the door for a collective to come together. While there are disagreements and differing opinions, the tribes are stronger together as a cohesive front. As they collaborate through conflict, they are laying the foundation and establishing a unity for the battles to come. Arvol Looking Horse leads a group of Lakota riders into the Oceti Sakowa Camp for a sacred ceremony. Navajo and Hopi youth arrive after running from Flagstaff in a spiritual show of support. Running is a sacred tradition in Navajo culture. This is a battle being fought with love, prayer, ancient tradition, and ceremony. It’s founded in respect, unity, and forgiveness. The courthouse was saged and the police forgiven for brutalities I can’t fathom—not for the benefit of the authority, but instead so those harmed could move forward without the burden of hate and resentment. Because "forgiveness is medicine.” Because from this healed place action is taken. "We're here to show you what love looks like. It looks like this. It looks like praying. We have been praying for months and they call us rioters." The activism at Standing Rock is a powerful blueprint for the path forward for our nation, which feels more divided and brutalized than ever. I’m mad—I’m mad at the left, I’m really mad at the right—and I definitely always think that I am correct. All of us feel this way, and honestly, we’re all a little wrong. That’s why we need unity despite our differences, a singular purpose, and most importantly to practice love, tolerance, and restraint. Collaborative effort has always proven to create greater change, build better ideas, and ultimately lay the foundation for a more diverse and respectful world. We’re entering a time where there are many battles to fight. We need to focus. All of the issues emerging at Standing Rock are the same issues currently threatening our entire nation: We are facing a government that will—to borrow from the tribal chairman—disrespect our land, our people, and our rights. We’re laying our foundation by marching together and getting fed up. Let’s build this unity—our differences will ultimately make us stronger. Let’s get together and heal and go out and fight for what’s right, despite our differences. It’s important to note that I am white. Our role as white people in this battle and in many to come is simply to listen and to amplify, to use our privilege to access places others can’t go, and to support the fights for equality and justice happening all around us however we can. On Saturday, a group of protesters entered DAPL land and formed a circle. 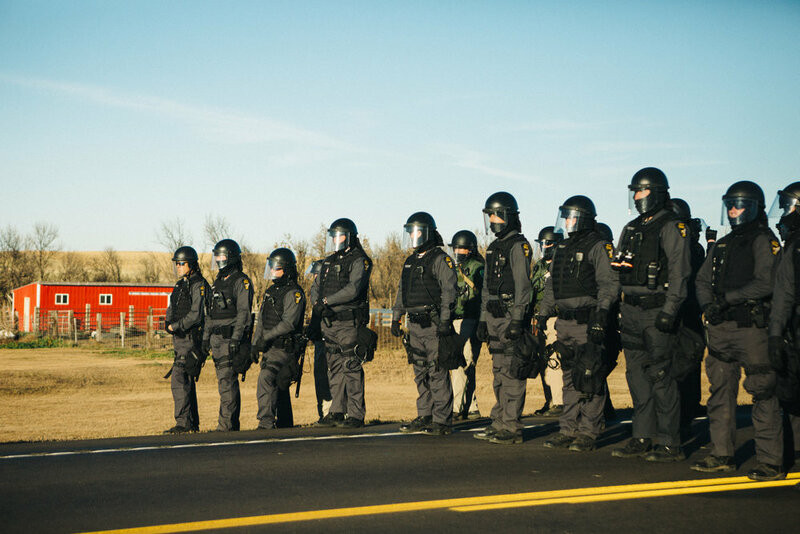 In the center were native elders, then people of color, then white allies buffering the inner circle from the police. 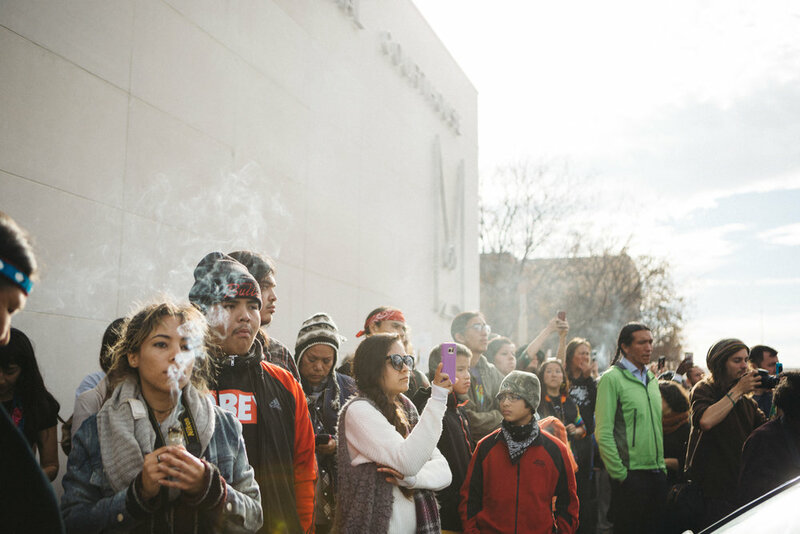 The speakers were both Native Americans and leaders of the Black Lives Matter movement. White privilege enables some of us to more safely take a stand and gives us a responsibility to help where we are needed—and only where we are needed. Standing up from a place of fear and rage is not constructive—it needs to be channeled into love. Arguing amongst each other isn’t entirely productive—we need to try listening. Our collective power is greater than any individual idea. Let’s keep our heads up through the battles and to ultimately win the war. 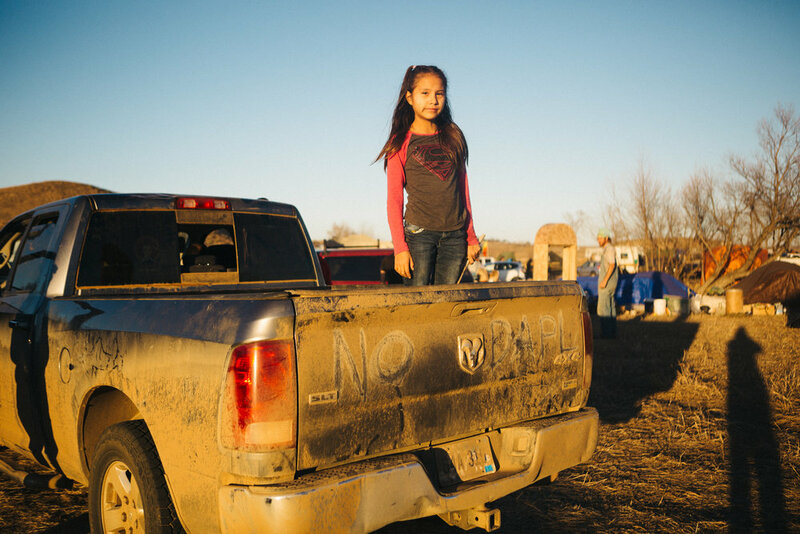 You can support the water protectors here. Molly Adams is a Los Angeles resident who takes pictures. She will live in Los Angeles forever but might visit your city sometime soon. If you're looking for her she is often that kid with the camera at the party. You can also find her on Instagram if you want.